But how do we gauge the state of earth's wildlife, wildlands, and oceans? 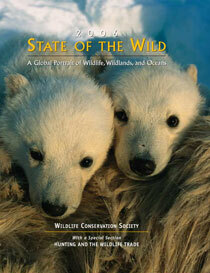 State of the Wild is a new series that brings together some of the world's most renowned conservationists and writers-George Schaller, Alan Rabinowitz, Sylvia Earle, Rick Bass, Bill McKibben, Tom Lovejoy, and many others-to assess wildlife and wilderness, and to provide insights into how humans can become better stewards of the wild. This new series combines evocative writings with a fascinating tour of news highlights and vital statistics from around the world. One-third of each volume will focus on a topic of particular concern to conservationists working to protect wildlife and our last wild places. This 2006 edition explores the impacts of hunting and the wildlife trade through a range of essays: Ted Kerasote traces the history of hunting in North America; Carl Safina, Eric Gilman, and Wallace J. Nichols quantify the toll taken by commercial fishing on seabirds, turtles, and other marine species; James Compton and Samuel K. H. Lee explore the global reach of the wildlife trade for traditional Asian medicine.